NEBOSH General Certificate in Occupational Safety and Health is suitable for managers, supervisors and employees in all industry sectors with responsibility and or a keen interest in health and safety in the workplace. It is also suitable for safety, health and environmental practitioners who wish to formalize their experience and progress their career with a professional qualification. We would require a pre-course interview to discuss the course and to establish that this level is suitable for the candidate. No previous health and safety knowledge is required, but candidates should note that the assessment includes a requirement to write a short report and sit written examinations. Day release – one day per week taught study, for the duration of the course plus additional revision days. 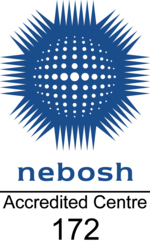 The NEBOSH certificate qualifications are delivered in modular units where applicable. As an established course provider, we have a team of experienced tutors, excellent teaching facilities at Jubilee Court and a high standard of teaching materials and resources. The tutors have a diverse range of experience from many backgrounds including: consultancy services, NHS, manufacturing and engineering, chemistry, education, nuclear and construction. Approved under the ELCAS Scheme.